Freshwater salmon fishing lodge, seven miles from Bristol Bay on the Alagnak River. The Alagnak River in Alaska is known as one of the best salmon fisheries in the Bristol Bay Region. The river is unbounded by dams and its headwaters start in the Aleutian Range. The river then flows down to Bristol Bay and the Bering sea. Most of the Alagnak river flows within Katmai National Park and Preserve with little human traffic, the river is as natural today as it was 100 years ago and will remain free of any pollutants. The river has prime spawning gravel to boast healthy strong runs of all five species of Pacific Salmon! The fishing here is concentrated around the tide water which offers the best possible fishing for fresh hard fighting salmon. The closer the salmon are to the salt water the better tasting and more aggressive they will be. The strategic location of this lodge allows fishing right out the front door and the quickest access to the best salmon holding water. With each tide fresh salmon ride in on the high water and enter the river to begin the up river journey to the spawning grounds. You will be there to intercept them with your guide assisting and improving your angling technique to get into the fish! The lodge offers comfortable accommodations and even in this remote setting you will feel at home. The lodge sits high on a bluff overlooking the river. The boats and dock just down the steps and always ready to go out for another fishing session. Fishing on the Alagnak can be done with either fly or spin gear depending on angler preference as well as water conditions and fishing area. With either technique you choose you are sure to get into salmon while fishing the world famous Alagnak. Fishing the lower and middle sections of the river offers a steady supply of fish. The upper sections that braid out can offer excellent sight fishing whereas the lower river you will often be fishing the deeper runs that hold fish as they stage before swimming further up river. For most of July and August the Alagnak sees a good overlap in the different salmon species. Most dates in the season offer 2-3 species of salmon available to the angler offering plenty of variety in the fishing and techniques. Most fishing will be done 10-15 minute boat ride up or down river from the lodge. You can choose your number of days. Most popular is the 5 day trip. Base price is $725, plus $725 per day. Daily government tax is $14.50 per day and not subject to discounts. Returning guests receive a 5% discount. Groups of 4 or more receive a 10% discount for all in the group. Non-fishing spouses and children 15 and under receive a 50% discount. This will not be combined with other discounts. Those fishing with 3 or more to a boat will all receive a 10% discount daily. *Those who want to be guaranteed to fish alone with a guide and boat can pay $300 extra per fishing day. This must be reserved in advance. **At times we can accommodate arrival at the lodge between 3pm and 6pm the day before the client starts fishing. $150 is the charge for this service and it includes lodging plus supper and breakfast. This is done to allow clients to limit their travel to one day and avoid an overnight stopover in Anchorage or King Salmon. This option is subject to lodging availability. The lodge sits on a bluff overlooking the river and is just above tidewater. Offering a comfortable stay guests will appreciate the views and wildlife seen from the lodge. The lodge holds a maximum of 20 guests per week. The lodge has seven single rooms and five rooms with 2-3 single beds. Some rooms are set to accommodate couple with Queen beds and some will accomodate families with children. All guests are housed in the main lodge. The lodge has all the amenities you would expect; modern indoor plumbing, 24 hour electricity, and daily housekeeping service. Our main downstairs room offers spectacular views of the river and is a great place to dine, relax, share fish stories with others, or take advantage of our well stocked fly-tying bench and get ready for the next fishing session. We also have separate small rooms to view videos, play cards or have quiet time alone. We even have a steam hut for those so inclined. You will enjoy chef prepared top quality wholesome and delicious items made from scratch and served buffet style. With plenty of dishes to choose from at each meal you won’t go hungry at this lodge! Freshly baked goods are available at the meals and as snacks throughout the day. All meals are served on time so we can maintain our fishing schedules. If you have food allergies please let us know so we can prepare and meet these special requests. Breakfast offers a wide selection on the buffet table plus the option to order items cooked to order by the chef. Lunch is typically soups, stews, pasta and typical lunch items. Dinner offers guests a variety of upscale main courses which always includes salmon and meat selections. You will wake up to a hearty breakfast served from 6- 7am buffet style with some items made to order. After breakfast you will gear up and meet your guide for the morning session. The lodge location for salmon fishing is ideal, you won’t waste precious time and expense traveling to the fish. Dinner is served at 7pm at the lodge. After dinner you can relax and hangout or head out with your guide for the evening session. Many guests really like the evening as it offers exclusive fishing on the river as most other lodges are off the river at this time. The evening sessions can be very productive! When freshwater salmon fishing, there is one simple rule…the nearer you are to the ocean, the fresher the fish, and the better the fishing. Once pacific salmon enter the river they go through a transformation and stop feeding. They put all of their energy into swimming up river to begin their salmon ritual before eventually dying. That being said the longer a salmon is in fresh water the lesser quality the meat. The salmon will have less fight and power as when it first entered the river. If you are looking to battle the freshest hardest fighting salmon that many come to Alaska each summer for then this is the lodge for you! Expect salmon that will test the gear you are using and your own personal strength, fish that will leap and provide violent head shakes, if this is what you are in search of you will find it on the Alagnak. The King or Chinook salmon is the largest in size of the five species of pacific salmon. Offering anglers true big game fish excitement the King is the hardest to catch and will take the most skill and time. The Alagnak River boasts the largest kings that are caught in Bristol Bay each year. The adults range from 20 to 45 lbs, but fish in excess of 50 lbs have been caught. Consider letting the females go to spawn for future generations and keep the males or jacks. The run size on the Alagnak is estimated at about 10,000. The run is at its peak in mid July but a multitude of factors will affect the peak dates. Kings can be targeted with both casting reels and fly or spey rods. Kings will be targeted in big water in the lower river. Once hooked hang on it will feel like trying to stop a freight train! The sockeye or red salmon are the first species to come into the river each year. The best fishing is found from the 1st of July through to the third week of July. This is a short-lived run but the largest run in terms of numbers. When the sockeye are running the river is teeming with them. Sockeye on the Alagnak will average 7-9 pounds. The run is estimated at 3 million per year! Sockeye offer a fun fight and are arguably the hardest fighter for their size. These are great fish to fill your boxes with in July. Chum Salmon or dog salmon are a very powerful fish and undoubtedly the most aggressive. They constitute many broken rods each season and will test your strength; a solid day of fishing for chums will have your arms sore! Chums start holding in the shallow sand bars mid July and continue until the middle of August. Chums readily take a bright colored fly or pixie lure. They average 8-14 pounds and an estimated run of 1 million will offer plenty of opportunities to catch them. Chum have a lower fat content and are only kept when chrome and silvery. Once they begin to turn green, red, and black there meat is inedible however they are still one of our favorite sport fish. The pink or humpy salmon are unique among pacific salmon in that they go to the ocean in their first year of life then return to spawn in their 2nd year. The pink salmon only spawn on even years in the Bristol Bay Region. They begin the run at the end of July and continue to mid August. These are the smallest of the salmon but provide endless fun. Pinks are aggressive and scrappy fighters. The Alagnak run is estimated at 1 million. Silver or coho salmon are the star attraction on the Alagnak. The first silvers show up the last days in July and continue strong until the end of August and into September. Commercial fishermen do not target the silvers and the runs have only increased in recent years. They are aggressive and offer spectacular leaps and drag screaming fun. Silvers are one of the best salmon for the table. The average size is 8-14 pounds with some exceeding 18 pounds. 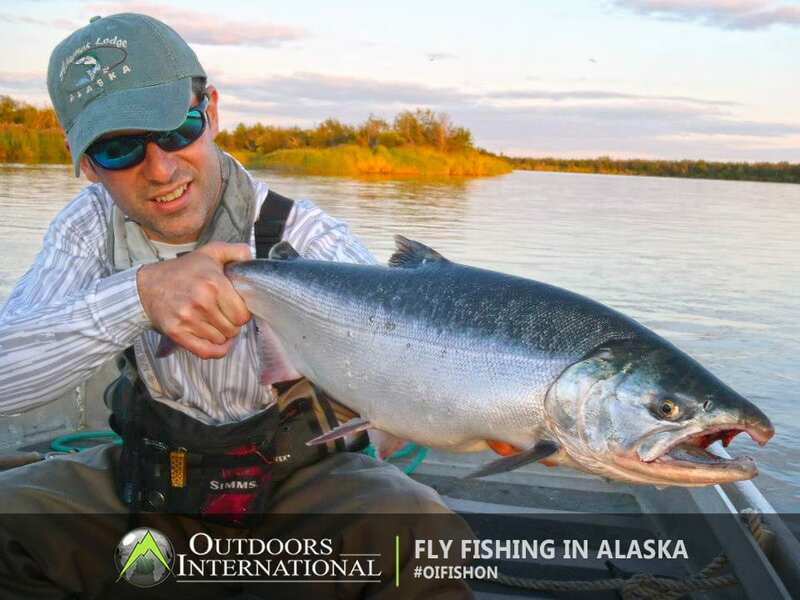 Silvers are one of the most popular salmon to fish and fly angler’s love their aggressive nature. You can often watch a silver wake as it chases your fly or lure. The silver season coincides with the best rainbow trout fishing. Rainbow trout are also present on the Alagnak all season long. They offer a challenge for the fly angler and can be tough to fool. The best rainbow fishing is up river in the braids where the rainbows will gorge on salmon eggs and flesh. This is the best time to catch a trophy Alagnak River rainbow. Rainbows average 18-24” but each year many are caught that go over 24” and can reach up to ten pounds! Rainbows offer an exciting fight and often jump and pull line off your reel. June and July can offer great trout fishing as well on streamers, mice flies, and dry flies. These rainbows are some of the most beautifully colored fish you will ever see. Arctic grayling are a small beautiful fish native to the Alagnak. Grayling sport a large oversized dorsal fin that glimmers with color in the sun. Grayling are surface feeders and renowned for taking dry flies. They are found in the upper reaches of the Alagnak and are a special treat when caught. All guiding is done by seasoned professionals who understand both fly and spin techniques. The guides are trained in boat safety. Guides know the river and area well and are sure to help get you into fish. This lodge utilizes ten 18 foot welded aluminum flat bottom boats with 40 HP 4 stroke Yamaha motors. Fishing can be done from the boats or wading is also an option in some parts of the river. July and early August give you the opportunity to catch a variety of salmon species on any given week. Late July gives an opportunity to catch the “grand slam,”all five species of salmon in one week. August belongs to the Silvers with the Pinks and Chums providing variety. The Lodge is located in the tidal section of the river about 5 miles inland from the mouth. The lodge is remote and is 25 miles north of the town of King Salmon, Alaska, and about 300 miles southwest of Anchorage, Alaska. To get to the lodge, you will need to travel to Anchorage, Alaska, (ANC) and then to southwest Alaska’s regional airport in the town of King Salmon (AKN). There are no direct flights from outside Alaska directly to King Salmon. Most guests arrive into Anchorage (ANC) in the late afternoon or early evening the day prior to the trip date. They usually stay near the airport then take a morning flight to King Salmon (AKN). On departure guests fly out from King Salmon mid afternoon or early evening then depart from Anchorage in the evening to their home destination. Flights scheduled out of King Salmon should be scheduled for after 3PM. Online reservations can be made on the Alaska Airline website as they codeshare with PenAir and market all flights between ANC and AKN. Peninsula Airlines (PenAir) is the main airline serving the ANC to AKN route. Once you arrive at the King Salmon airport you will be met by our flying service, Branch River Air (BRA) (907-246-3437), often given the ability to make quick purchases at the local general store, then driven to the BRA river office. Once all the incoming passengers are assembled and a float plane is available, you will be flown 25 miles north to the Alagnak Lodge dock. Departing guests will then board the floatplane and be returned to King Salmon. The flight time is about 25 minutes in the air plus the time to taxi on the water at both ends. **Under special circumstances and with advance approval, clients may arrive in the afternoon and be flown to the lodge, but these flights must leave King Salmon before 6PM. Heavy fog and weather events can, and often do, disrupt air service. Both Pen Air and Branch River Air follow visual flight rules, and they have to play it safe. For this reason, we like the incoming passengers to arrive in King Salmon between 9:00 AM and 12 AM and departing passengers to depart no earlier than 3 PM. A missed flight can be a really big problem, particularly in July when the commercial fishermen and fish processors are flying in and out. If you try to arrive too early in the morning, there is a greater chance of a weather delay than an arrival scheduled later in the morning. You may also need to wait for later arrivals for the flight to the lodge. Attempting to leave AKN before 3pm is tempting fate. Too much has to go right to catch an earlier flight and the change fees are expensive. Keep in mind that we offer free laundry service so you will be able to use clothing multiple times.We have a good supply of quality waders and boots in good condition. We are adding to this inventory every year.We have sufficient casting rods and casting reels to accommodate all guests. We have both spinning rods and reels and fly rods and reels for those wishing to fish in this manner. These are not as tough as the casting equipment and the guides have to book them in advance. Please let us know in advance through the guest information form if you want to use our fly and spinning rods and reels.We have a well stocked fly tying area and a good selection of terminal tackle available for the use of our clients. We expect to supply all needed terminal tackle.If you have fishing equipment you are comfortable with and fits you correctly, you really should bring it. While our equipment is of good quality, it may not fit your preferences or be your exact size. Our fishing related inventory is intended to fill the needs of the casual fisherman or adventurer traveler as well as allow seasoned anglers to travel with less baggage. It allows them to participate without making a large investment. We do not expect you to have a casting rod and reel strong enough to handle kings, so we have enough of those to supply the full lodge.The lodge will provide the rods, reels and lines you need. If you want to bring your own you should do so. Here is a broad overview of what is appropriate for fishing the lower Alagnak. Line: 24ft, 300-400 grain sink tip. Shooting head systems are also popular. Line: 13ft Type V sink tip for streamer, sculpin or leech patterns. Weight forward floater (dry) for dead drifting dry flies and egg patterns, skated dry flies, and deer hair mice. Guides tie and provide their own flies as part of their service to you. However, many of our guests like to tie and use their own flies. This is of course just fine with us. At the Alagnak Lodge we maintain a well- stocked fly tying area available to all at no additional charge. Enjoy the instant gratification of tying a fly then using it catch a great fish. We use various lures and spinners for the casting and spinning rods. We supply these, but you can always try out some of your own.